October is National Bullying Prevention Month. This is an important topic for all of us to understand and advocate for. I often dealt with verbal bullying from a couple kids at my school and some physical bullying. I think verbal abuse is just as bad, if not worse than physical abuse. They both leave scars of a different kind. I was short and always a little “plump”. I started wearing glasses when I was just 10 years old. I also hit puberty earlier than most of my friends which led to even more physical awkwardness. I have always been self-conscious and struggled with feeling like I don’t fit in with the crowd. I do remember one classmate who would frequently pick on me and take things from my desk or hide my book bag or pull my chair out from under me before I sat down. I hit the floor more than once and man did it hurt, but that pain was nothing compared to the feeling of embarrassment of being tricked and falling to the floor in front of everyone. I can remember putting canned food in my pocketbook and using that to swing at this classmate when she tried to mess with me. I might have been small but I was spunky (and still am!). I hold no grudges though and actually became good friends with this person several years later. I found out that she was dealing with a different kind of abuse at the time and I know in her young age she was simply acting out on all the horrible feelings inside that she didn’t know how to deal with at that time. There are many ways to prevent bullying and it all starts with setting an example to our own kids and the young people we influence by not being bullies ourselves. Bullying is often a learned behavior or an acting out of inner pain, insecurities and struggles from home. Having an open dialogue with your children about bullying – both how to not be a bully and what to do if they are bullied is the second step to helping prevent bullying. If your child is acting out and being a bully, it could be that they might have been bullied themselves in the past or been a victim of another type of emotional or physical abuse. Please be sure to talk to your children about all types of abuse and what is appropriate and not appropriate so they feel safe coming to you should they ever be a victim of bullying or abuse. Encouraging young children to believe in themselves and finding extra curricular activities and hobbies that they can excel at and enjoy is also helpful. When children are occupied with doing positive things and have something they feel a part of or a sense of pride about – it builds their self-confidence and sense of self-worth. Whether it is being part of a local church youth group, the Boys & Girls Clubs of America or the Boys and Girl Scouts or other community outreach programs. Programs like Sing for Hope which encourages art advocacy helps young people learn how to create positive change through artistic self-expression. Artistic and musical expression can be very healing and inspiring for children and adults alike. Most of all it is important that we ourselves be kind to others, that we show love and grace and“be the change we want to see in the world”. (Gahndi) Those of us who can take a stand and help others should do whatever we can to help prevent bullying and other forms of abuse by educating, enlightening and empowering others so we can put an end to the cycle of abuse. 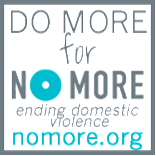 If you or someone you know has been or is being affected by bullying, I encourage you to check out the many online resources including NoMore.org to learn more ways to prevent bullying and other forms of abuse and how to find healing from the scars of abuse. *Disclaimer: This is a sponsored post. Regardless, all thoughts and opinions and stories are 100% my own. Fantastic tips, thank you! I’m always worried my son will have to deal with bullying, so preventing that is important to me. This is such an important topic. I hope more people take steps to increase awareness. This is such an important issue in our society! Thank you for taking the time to talk about it and offer resources for those in need. Being bullied destroys people, it doesn’t just have to be children, but adults as well. I enjoyed your article. Thank you. As a teacher, bullying is definitely something that is always on my mind!